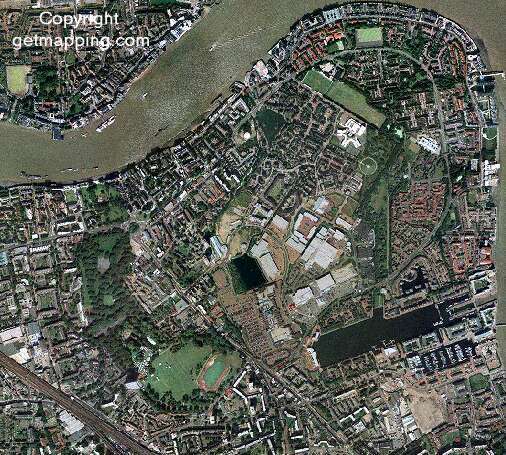 This image is a compressed version of a low-resolution aerial photograph of Rotherhithe produced by getmapping.com, though it still takes a few seconds to come through. If you are impressed by this, imagine what the high resolution images they sell are like. On their website, you can zoom in and out of their images, and order the better high resolution pictures as a photographic certificate. Further below is another picture from the 1930s. 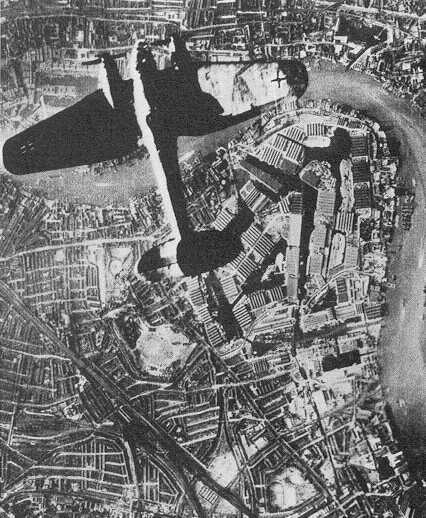 The next picture is a German propaganda picture issued in World War 2 of a bomber flying over the Surrey Docks. There are reasons to believe that it was faked, using an aerial photograph from earlier in the 1930s. The Millwall History Files give more details and the opportunity to see a wider picture also covering parts of the Isle of Dogs.